Is the Chicco Fit2 infant car seat a good choice for your family? Find out in our 2019 review. 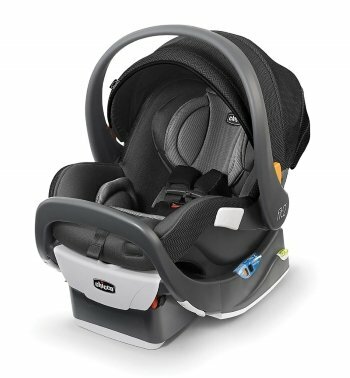 The Chicco Fit2 infant car seat features a unique 2-stage adjustable base that provides a better fit for toddlers who are rear-facing. For those of you who are worried about your toddlers being cramped, this could be just what you’re looking for. We’re already fans of the Chicco brand. The Chicco KeyFit 30 has topped our list of infant seats for quite some time. This model has many of the same features, but the 2-stage base is the main new and innovative feature. There are a few flaws in this seat that you may want to consider, specifically the weight of the carrier and limited stroller compatibility. The Fit2 does have several other features the original KeyFit doesn’t, which may sway your decision in its favor. Toddler mode (Stage 2) is designed to provide a more upright position for older babies and toddlers. However, infant mode (Stage 1) can be used the entire time until the child outgrows the seat. Note: According to the manual, use Stage 2 ONLY if your baby can crawl or walk. That being said, Stage 2 is listed as being for 9 – 24 months old. Since the AAP now suggests rear-facing for as long as possible past 2 years old, this isn’t exactly the best option for extended rear-facing. But since many parents still switch to forward-facing well before 2, thinking their children are cramped, this seat could ease parents’ worries and help extend their rear-facing time. What are the child size limits of the Chicco Fit2 infant car seat? A removable infant insert provides good head/neck support for newborns (up to 11 pounds). The headrest has 7 positions and 2 crotch strap positions to accommodate growing toddlers. Some parents have found that children who are at the top or beyond on the growth chart or who have long torsos may outgrow the seat before 2 years. How big is the Chicco Fit2 and will it fit in your vehicle? The good thing here is that the Fit2 takes up no more room than the KeyFit 30, at least width and depth wise. When the headrest is extended, it will exceed the KeyFit’s height, but otherwise it should fit in most vehicles that the KeyFit 30 will fit in. But it might be a tight fit in very small fuel-efficient cars, especially if you need more than one car seat in the back. Note: This seat will not fit well in the in the middle seating position on some vehicles with indented center seats such as Ram 1500 trucks. It will need to be installed on one of the side positions. The bad thing here is the weight of the carrier. At 12 pounds, it’s 2 pounds heavier than the KeyFit 30. That may not seem like a lot, but when you have a 10+ pound baby to pack around, it can wear your arm and back out really quick. How safe is the Chicco Fit2 infant car seat? As always, we appreciate real-life testimonials when it comes to safety performance in car crashes. One mom reported that her 2 month old baby girl was totally fine after a wreck that totaled their car. Note: Newborns with very round heads and long torsos may experience head slumping due to the gap between the headrest and infant insert. In that case, it may actually be safer to remove the infant insert. Beyond that, the Fit2 has all the same safety features of the KeyFit that make it one of the most reliable seats on the market: SuperCinch LATCH with push-on connectors, EPS foam, a bubble level, and seat belt lockoffs. The Fit2 has the added benefits of an anti-rebound bar, large headrest with padded wings, and the 2-stage base that allows for a better rear-facing fit for toddlers. Keeping babies rear-facing is the safest position for them as it better protects their delicate spines and necks. The Fit2 is also super easy to install (which we’ll talk about more in the next section). Ease of installation is one of the most important factors when it comes to safety. The easier a seat is to install, the less likely there will be a malfunction during a crash. How easy is it to install and use the Chicco Fit2 infant car seat? This may be the biggest selling point of this car seat. The push on LATCH connectors alone make it much easier to install than seats with hook connectors. Just like the KeyFit, it has the one-pull center LATCH strap that operates the SuperCinch system which multiplies the tightening force so you don’t have to be Superman to get a tight fit. Installation tip: Make sure the excess LATCH strap is tucked away into the little storage area in the base so it won’t interfere with the carrier/base connection. If you do a seatbelt installation, it’ll take more force to get it tight since you don’t have the SuperCinch to help you. In that case, it might be easier to install on one of the side positions rather than the middle seat. However, you do have the option of a European belt path installation, which can be a real life-saver if you’re using rideshares or taxis. Some customers have been able to use KeyFit adapters for other stroller models such as the Bumbleride Indie, Bob and Uppababy Cruz. 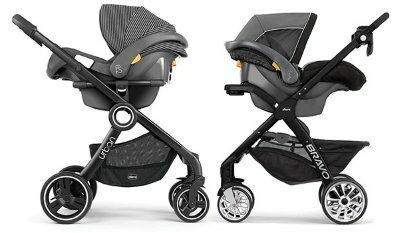 If you don’t have one of the compatible strollers, check with the stroller manufacturer to see if they have an adapter that will work, or call Chicco customer care at 1-877-424-4226. Try these products to enhance your baby’s car ride. An extra base is a must have in two-car families who switch vehicles often. Buy two extras, and give one to the grandparents or babysitter so they’re always ready for a fun outing. A great alternative when you don’t want to haul around a full size stroller. Just click your car seat onto this lightweight frame, and off you go. 2 cup holders, a covered storage tray and storage basket provide all you need for a stroll or airport travel. There’s a lot to love about the Chicco Fit2 infant car seat. 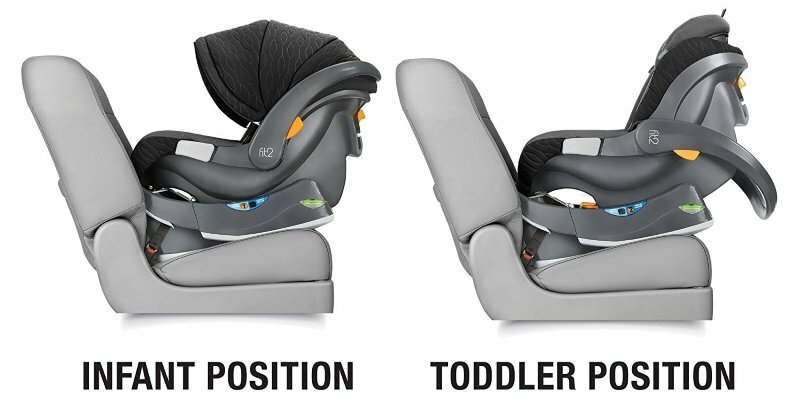 There’s the easy adjustment to toddler mode which allows for more legroom and a more upright position. There’s also the simple installation and added safety features that make this seat kind of like an upgrade to our top-rated Chicco KeyFit 30. As a carrier, it’s a bit too heavy for extended carry time, but if you don’t plan on carrying it that much, that shouldn’t be a big issue. Stroller compatibility is somewhat limited but again, that’s something you can easily work around. A couple other factors might come into play. One is price. At around $280, it’s not a bargain seat. Also, if your baby is used to a regular infant seat, it might take them a little while to get used to the feel of this one in toddler mode due to the upright position and wide padded head wings. Other than these minor things, most parents are loving this seat. It could be a good investment for just about any family. ❮ Read our 2019 detailed review of the Evenflo Maestro combination harness-to-seat belt booster car seat to see if it’s the right choice for your family.